Updates: India won the Toss & Chose to Bowl First. Yup..! The much awaiting match will start with the protection of well-dressed patrols. 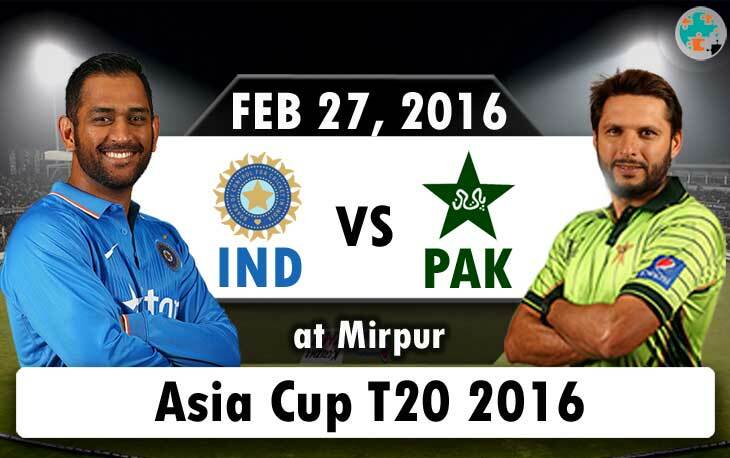 Indo-Pak Asia Cup T20 2016 match is now on air. India won by 76 runs on their last meet on World Cup 2015 is one of the notable thing here. India won six of their last seven matches against with Sri Lanka and Australia. So, all the Indian fans are expecting this well-performance by India on upcoming matches, especially with Pakistan. Both of the team will face each other in exactly after a year and 11 days. So, this match makes higher expectations on both of the fans from India and Pakistan. Dhoni’s back muscle spasm is one of the worries for Indians, even though he attempt his first winning match against Bangladesh. But, he has skipped his training in Fatullah on Friday, if suppose he decided to skip then, Parthiv Patel will be the back-up wicket-keeper who gets the chance to play this match. Recently, Pakistan concluded their Pakistan Super League (PSL), and now, the players are well prepared for this Asia Cup 2016 T20 series. Umar Akmal, who was the most top run scorer on PSL with 335 runs on seven matches is really in good form. One of the best pacers, Mohammad Amir, will come back to the International cricket after five years of Ban because of spot-fixing. But, it was unknown aspect about Amir on the row of XI. If he was on playing 11, then he is a perfect corner for Pakistan in this match against India and it will be nice to see Rohit vs Amir were both are in good form. The top line-up of India with Shikhar Dhawan, Rohit Sharma, and Virat Kohli are all in good form in their recent matches about their performance. Especially Rohit Sharma’s 83 out of 55 balls with seven fours and three sixes made the good opening on the first match of Asia Cup 2016, and also, his score helped to win the match. Suresh Raina and Yuvraj Singh played decent shots and scored 13, 15 respectively. The All-rounder Hardik Pandya made beautiful knocks on last few overs and scored 31 out of 18 balls with four fours and one six. And the innings was ended with predictable huge six by the team captain, MS Dhoni. Jasprit Bumrah, Ravichandran Ashwin, and Hardik Pandya are all just gave 23 runs and took one wicket each. Ashish Nehra outperformed every other by taking three wickets, and Ravindra Jadeja gave 25 runs without any wickets in the first Asia Cup match against Bangladesh. Pakistan batting line-up was led by Mohammad Hafeez, Shoaib Malik, Umar Akmal, Sharjeel Khan and the impressive Sarfraz Ahmed; his excellently batting against spin may create the best total score. The captain Shahid Afridi led the Pakistan bowling line-up and formed with Mohammad Sami, Mohammad Irfan, Mohammad Amir, Wahab Riaz, and Anwar Ali. Shahid Afridi, Shoaib Malik, Mohammad Hafeez and Umar Akmal are only the four players, who have all faced the last India T20 International match on this same ground on March 21, 2014. And India won this match by seven wickets. Shahid Afridi (captain), Mohammed Hafeez, Sharjeel Khan, Umar Akmal, Shoaib Malik, Khurram Manzoor, Mohammed Nawaz, Sarfraz Ahmed (wicket-keeper), Mohammed Aamir, Mohamed Irfan, Mohammed Sami, Wahab Riaz, Anar Ali, Iftikhar Ahmed, Imad Wasim, Mohammed Amir.